Two organic posts for you today! First up, A’kin. [A’kin] and [Al’chemy] products are formulated free from sulfates, parabens, ethoxylated and petrochemical cleansers, propylene glycol, silicones, phthalates, mineral oils, DEA and artificial colours.Our products are ingredient rich, vegan, 100% natural botanical aromatherapy and formulated without animal ingredients or animal testing. 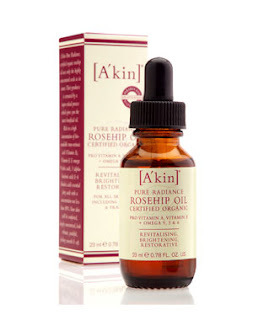 I was given A’kin Rosehip Oil to trial. The bottle tells me it has Pro Vitamin A, Vitamin E and Omega 9,3 & 6. It also says it’s revitalising, brightening and restorative. I’m always look for a bit of revitalisation for my skin, so I was looking forward to trying it. The recommendation is to apply 2-3 drops to the face and neck, once a day for oily/combination skins or twice for other skins. I tried to use it twice a day for the first week, switching to once a day for the second week as I am just not organised enough and my skin is combination. The oil itself is bright orange, which I wasn’t quite expecting as the bottle is tinted brown so you can’t see what you’re getting. This isn’t fragranced and smells of, well, plant is the best I can do. It’s not an unpleasant smell, just a very natural one. The packaging is a medicinal looking glass bottle with an old-fashioned dropper with rubber top. The dropper does collect a lot of oil in it, so I generally squeezed most of it straight back into the bottle to avoid accidentally using too much. That’s probably overcautious of me as the dropper does only dispense one drop at a time, making it very easy to control the amount you use. A little of this goes a very long way, so the 2-3 drops direction is about right. I was pleasantly surprised by how quickly it absorbs, especially as I was using it in the mornings and worried I’d have to wait ages before applying make up. It sank straight into my skin and I could apply my tinted moisturiser almost immediately. Results wise, I can’t say I noticed a massive change in my skin. My skin certainly felt soft, but it looked much the same as always. However, I do like this as a winter base for my tinted moisturiser. I felt like I needed a little extra moisturise and after applying the oil my moisturiser went on a lot smoother than without any sort of base. The other good point, and this isn’t on the bottle at all, but my hands looked a lot better from rubbing the excess oil in. Using this oil regularly meant all those little bits of loose skin around my fingernails disappeared, leaving me with much nicer hands. Overall verdict: As an extra layer of moisture in winter I’d use this product, it was a nice extra boost. It just didn’t do much in the way of revitalising or brightening for me. Having said that, I do have fairly good skin and it might work better for someone with dryer skin than mine. So there you have it, have you tried A’kin products, or rosehip oils on your skin? How did you get along? A’kin products are available from Wholefoods, and independent chemists. The Small Print: This product came from my own collection, all reviews are honest and impartial regardless of the source. Man, I could murder a Malteaster Bunny right about now. Kinda weird that I havent heard of this company at all, since I live in Australia! I'm still on the fence with oils. I don't have the Bio Oil love, I don't think it did much for my skin. This stuff is nicer to use than Bio Oil, easier to dispense and it feels like a heavier oil so doesn't run everywhere the same way. And yet it still absorbs very quickly. It might turn out to be a bit of a grower. I am still using it every day. Yeah, I have one of their serums. Not keen on the oily texture.